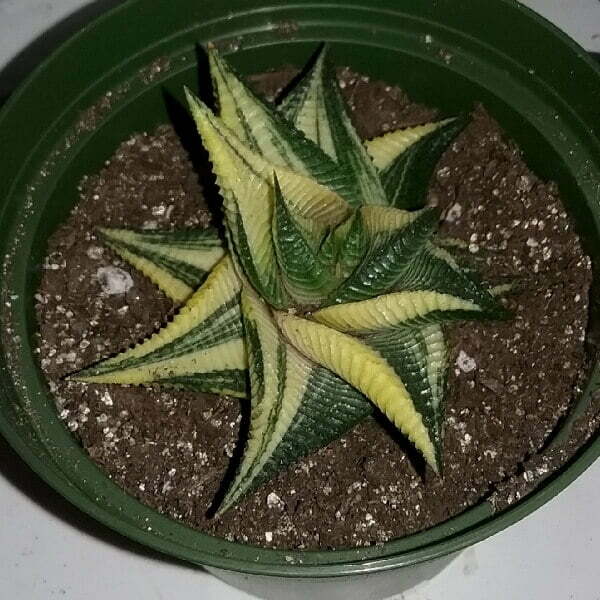 Haworthiopsis Limifolia Variegated is an ornamental, perennial succulent with large rosettes. 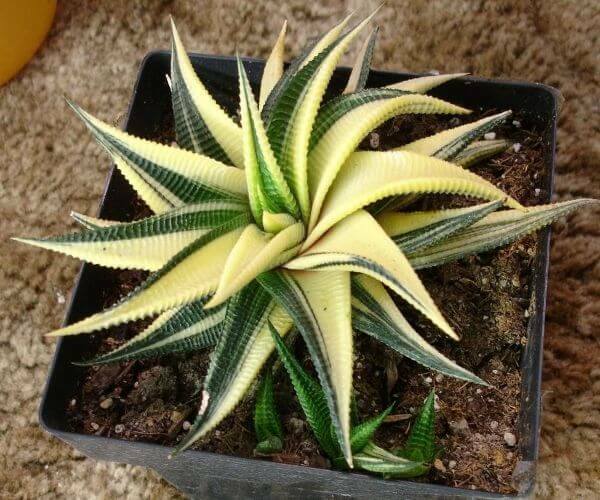 It produces triangular, elongated leaves 7.5 cm long, 2.5 cm wide are variegated dark green to greyish green and cream to light yellow and arranged in a tight rosette. Stiff, fleshy leaves have a rough, rippled surface and are slightly rolled inwards along the leaf margin. White, tubular flowers are arranged near the tip of a 35 cm-long inflorescence stalk. Common Names: Haworthiopsis ‘Limifolia Variegated’, Fairy Washboard, File-leafed Haworthia. It requires full sun but will tolerate partial shade. Place your Haworthiopsis plants on south-facing windows that will provide the most sun. It grows well in well-draining cactus potting mix or a part potting soil, part perlite and part sand. Haworthiopsis Limifolia Variegated can be easily propagated by the removal of offshoots or by leaf cuttings in spring or summer. To propagate by leaf cuttings, remove a leaf and let it lie for about one month, giving the wound time to heal. Then lay the leaf on its side with the basal part buried in the soil. This leaf should root within a month or two, and small plants will form at the leaf base. They can also be grown from seed.